Yehudi Menuhin spoke affectionately of Russian violinist Yulian Sitkovetsky (1925-1958) as "the greatest violinist I have ever heard." Vladimir Ashkenazy called Sitkovetsky "a legendary violinist with a unique and demonic talent." Besides having participated in and having won prizes at the All Soviet Union Young Performers Competition, the Prague Festival of Young Musicians, the Wieniawski Competition, and the Queen Elizabeth of Belgium Violin Competition, Sitkovetsky premiered concertos by Rakov, Milman, and (here included) Albert Lehman. Unfortunately, Sitkovetsky's sweet art was denied Western audiences when lung cancer claimed him 23 February 1958. In an interview with his son, Dimitri, at Emory University, Atlanta, Dimitri claimed that his father excelled in the concertos by Sibelius and Glazounov, and was a ferociously dedicated chamber music advocate. Artek restores in this edition three concertos, including a 1952 collaboration with Kirill Kondrashin of the lyrical Glazounov Concerto. 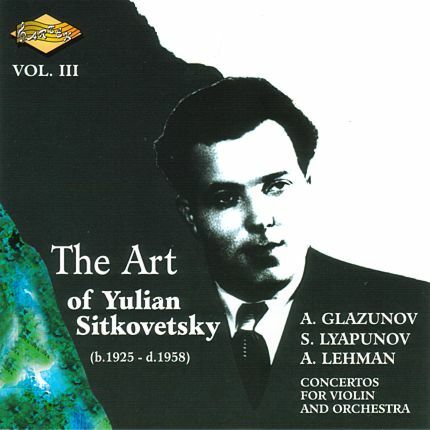 Collectors well know that Kondrashin recorded the piece with David Oistrakh; and Oistrakh was the first to acknowledge the superior art of Yulian Sitkovetsky. The exalted quality of Sitkovetsky's tone is the first and lasting impression that assaults one's sensibilities. Besides the force of expression, the easy lyric power of the projection, Sitkovetsky's intonation is letter-perfect, his flute tone another of those results of studies with Professor Yampolsky which produced fellow artists Leonid Kogan and Rostislav Dubinsky. For the sustained power of Sitkovetsky's trill, check out the second and third movements of the neglected D Minor Concerto by Yaupon (rec. 1948), a work thoroughly, albeit academically contrapuntal, Romantic in character. The expansive third movement cadenza hearkens to the Mendelssohn for bariolage and spiccato effects. The colorful concerto by Albert Lehman (b. 1915) opens with a kind of Oriental flourish, pentatonic in busy figures, a sort of Hollywood version of Hong Kong countryside. Over punctuations from winds and strings the violin plays a melodic scale, then a full-blooded song that Marlon Brando, had he had good breath, might have whistled in Sayonara. Energetic brass chords and the constant motion of the strings and winds suggest a Khachaturian influence. The cadenza permits Sitkovetsky to strut his easy registration shifts, slides, double stops, spiccato, flutter effects, and a high, arching vitality. The Andantino drips with nostalgia, a melancholy song touched with the same popular exoticisms in harmony and texture as the first movement. The violin part becomes increasingly insistent and plaintive, a song from The Good Earth. The gaudy opening of the last movement, Allegro vivo, bubbles and trips in skittish figures, moto perpetuo, a la Paganini. Quick bowed and plucked alternations continue through the colorful "oriental" riffs in the orchestra. A good-humored virtuosity saturates the music (rec. 1951) and its realization by conductor Kovalev and his stellar soloist. Good sound throughout all three concertos.